I love eggs! 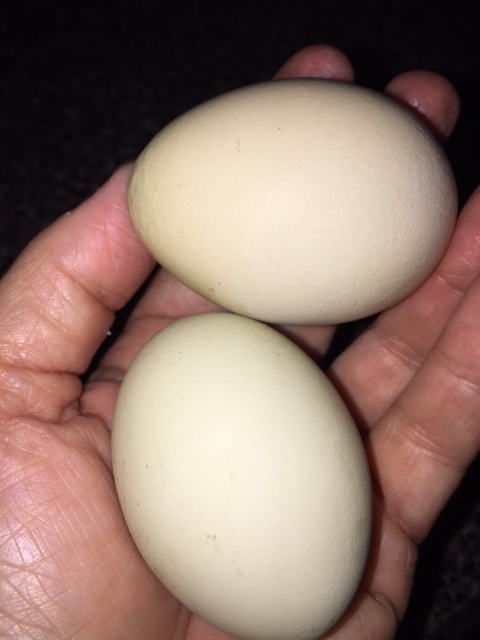 I love fresh eggs! Have I mentioned that I love eggs? 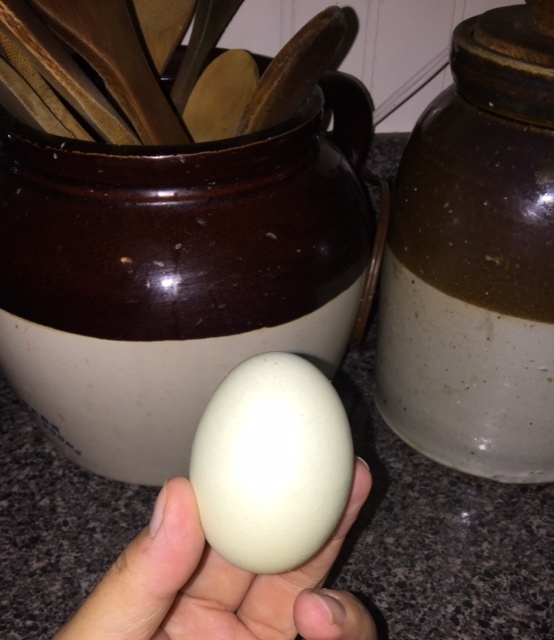 Eggs are also a wonderful and healthy source of protein. I limit myself on my intake of yolks to help maintain my cholesterol, but at least one morning a week, I thoroughly enjoy an omelet for breakfast. Other mornings, I love to create healthy dishes with egg whites. I am working from home today on this beautiful fall-like morning, which is one of the many perks about being a college professor. My hours allow me more time to work for the Lord with various activities in my church, spend time with my family, read, work in our garden, host my bi-weekly book club, blog, and work on an exciting upcoming novel. Yes, I’m writing a new book, but that’s a story for a future blog. Now, back to a delicious Italian omelet that make you feel like your dining in an Italian bistro! 1.) Heat skillet over medium low heat. Spray with cooking spray and add extra virgin olive oil. Allow oil to heat and add diced onions and ground turkey sausage. 2.) Stir gently with wooden or rubber spatula. Once onions begin tendering, add washed and sliced mushrooms. Add garlic and season gently with sea salt, and black pepper. Keep a close eye on the garlic to prevent it from burning. 3.) 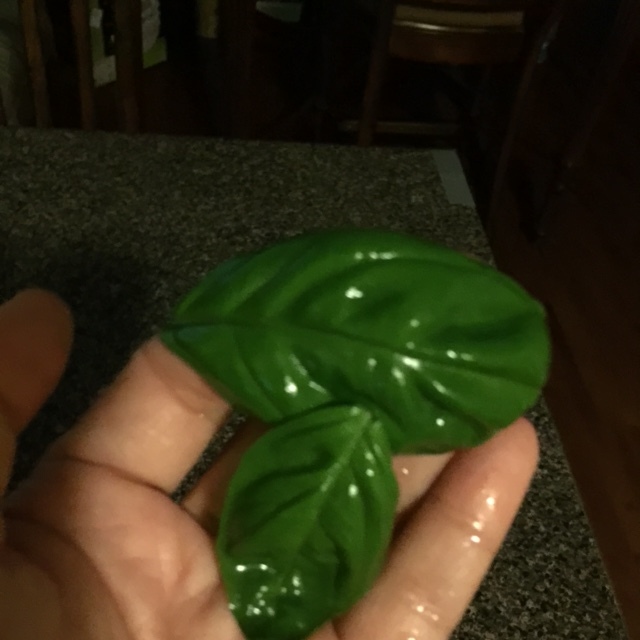 Wash two medium size fresh basil leaves. 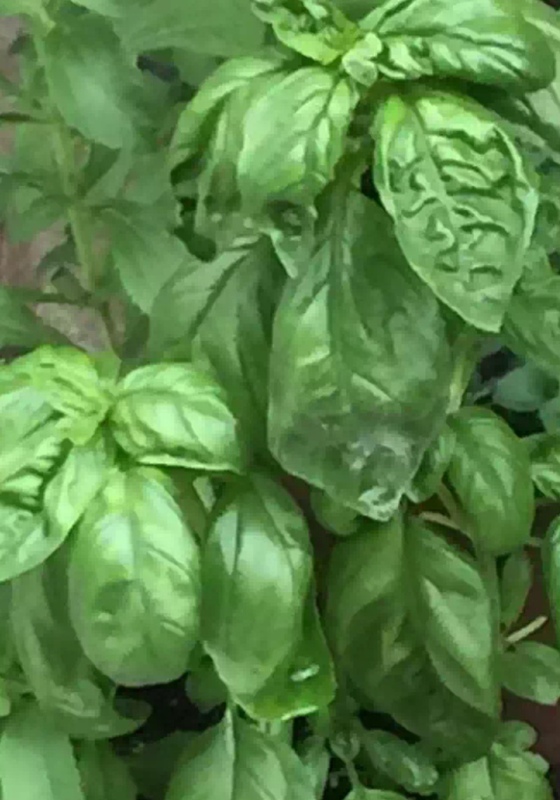 I prefer Italian basil for this recipe. You can cut the basil, but I prefer to use my kitchen scissors and snip it to the size I prefer without bruising it. Add basil and gently stir lowing the heat. 4.) Add oregano. I like to use oregano from my herb garden that I have dried, and have used fresh. Either are great. 5.) Crack two fresh eggs into a bowl and add milk. 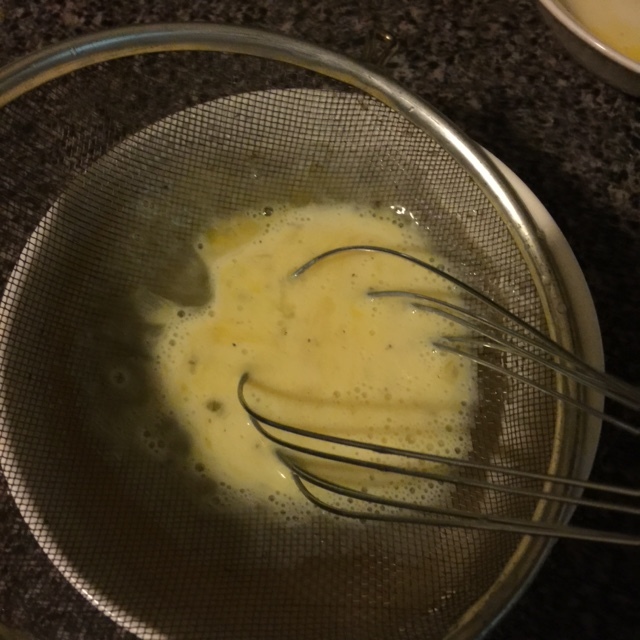 Gently whisk briefly and then add the egg mixture to a strainer to do most of the whisking. 6.) Whisk the eggs through the screen of the strainer. This helps remove any of the membrane or chalazae that may exist in the white of the egg. This also helps your eggs to be more fluffy. When it seems that there is some of the egg that just wont go through the strainer, your ready to add your eggs to the skillet. 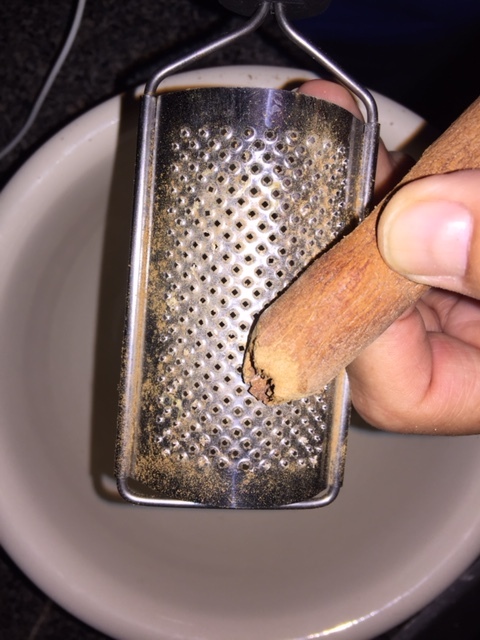 You don’t need what’s left behind in the strainer. 7.) Add egg mixture with feta into the now browned turkey sausage, tendered mushrooms, and onions. Don’t over stir while cooking. You may add a dash of salt and pepper if desired. 8.) Gently fold with a rubber, or wooden spatula until thoroughly cooked, and slightly brown on either side. 9.) Plate your beautiful Italian omelet, and top with a sprinkle of parmesan cheese. 10.) Serve your Italian omelet with marinara sauce for dipping, or to top your omelet. I also like to add chopped chives to my omelet. My husband enjoys this omelet with garlic toast. I’ll admit, the garlic toast tempts me like crazy! This is one of my favorite omelet recipes. I love Italian food, clean eating, delicious breakfasts, and that quiet time when I can sit and enjoy my breakfast with hot cup of coffee, and a great book! I love the early morning hours as well, but I think I’ve mentioned that before. 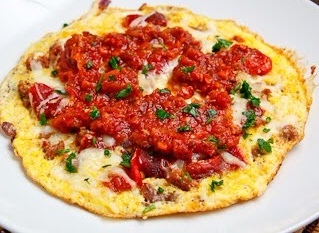 If you enjoy Italian foods, I’m sure will enjoy my Little Taste of Italy Omelet! Be sure to check out one of my earlier posts, Breakfast for a King or Queen, another great idea for a tasty healthy and clean breakfast. I would love to hear your feedback. Living on a farm, no matter the size, means there’s always work to be done. So, what better time to find a little relaxation than in the early morning hours? I’ll admit it, I’ve always been a morning person. I can recall as a child waking up early on Saturday mornings just to get outside and enjoy the day. I still enjoy waking early, sitting on the front porch, drinking morning coffee, and allowing nature to inspire my day. Through my journey to lose weight, achieve better health, and maintain a healthier lifestyle, I’ve discovered that relaxation is a must. For me, a brisk morning walk right after, or just before breakfast while the dew is still on the ground is one a greatest methods of relaxation. It’s also quiet time that allows me to meditate, pray, and enjoy the beatify around me. I can always find beauty in some form of nature on my early morning walk. While walking Freckles this morning beauty seemed to erupt everywhere! 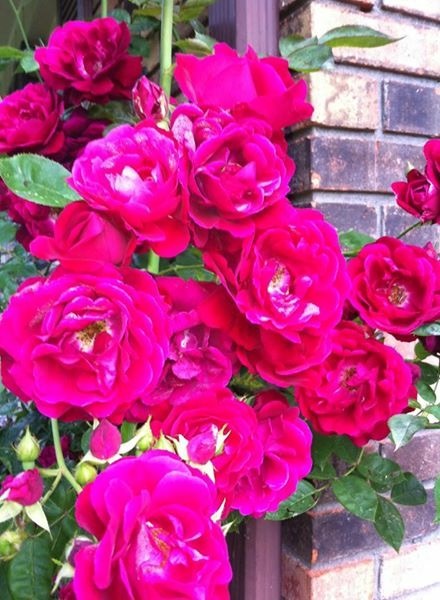 As we walked out the front door the sweet aroma of roses filled the air! I couldn’t resist…so, I took a few minutes to smell the roses before our walk began! 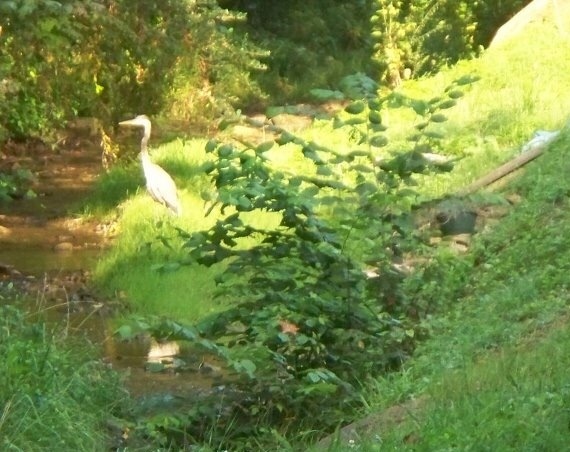 As Freckles, and I started down the lane for our two-mile walk, I noticed our usual early morning visitor, Mr. Crane had returned for a few minnows from the creek. He’s a handsome sight! 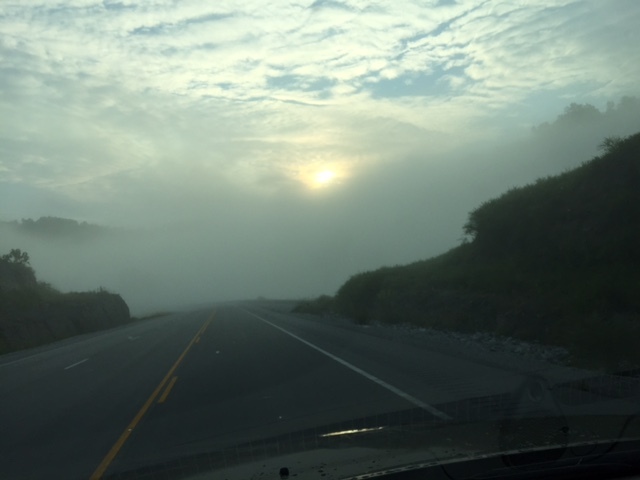 Here are a few pictures that I snapped on our walk this morning. Our summer roses are in full bloom. I spotted Mr. Crane a regular morning visitor enjoying a few minnows from the creek. 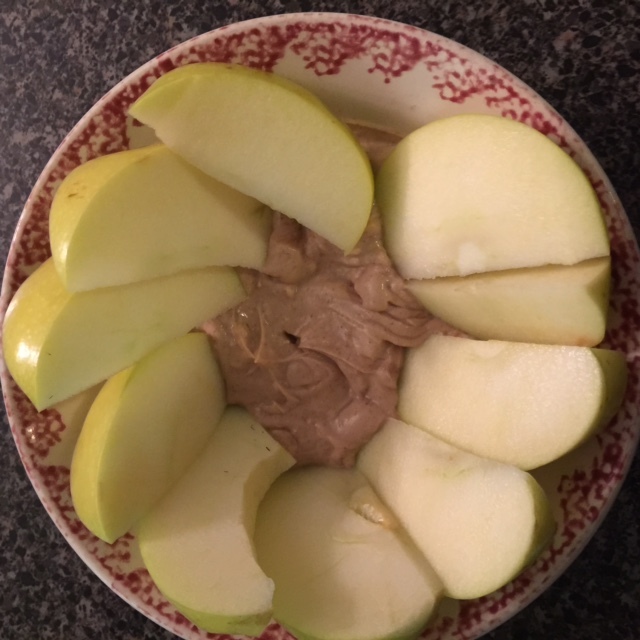 Enough about our morning…let’s get started with this delicious almond butter fruit dip. Honestly, this will make you feel like you’re cheating…when you’re not! It’s clean, easy, and delicious…all the qualifications of a great recipe! 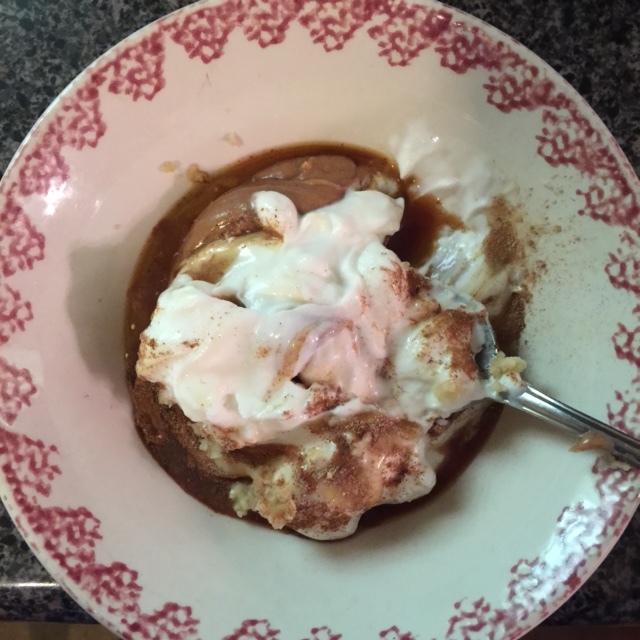 This sweet treat will also help stop that craving for something sweet that we all have. 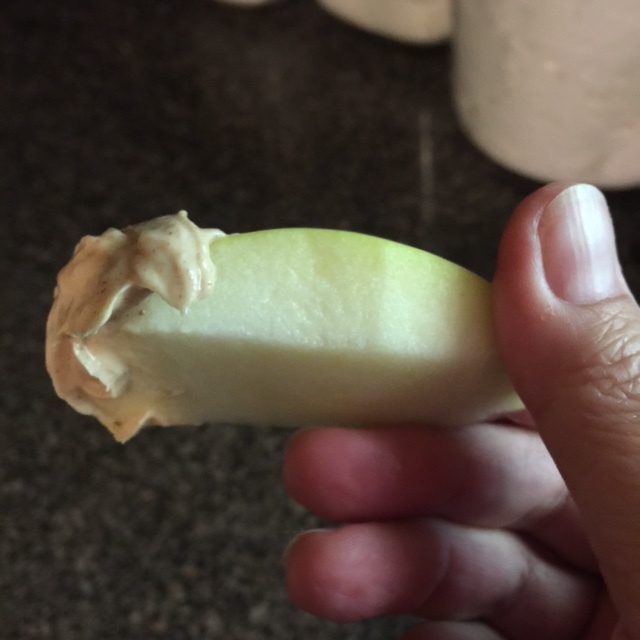 It’s a great snack for any time of the day, and a great snack for the kids lunch. Trust me, they will love it as much as you do. 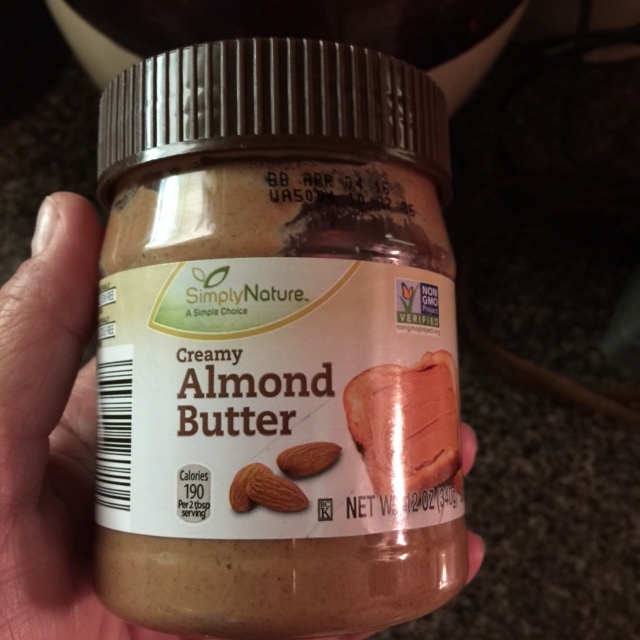 A delicious alternative to peanut butter that my family loves! 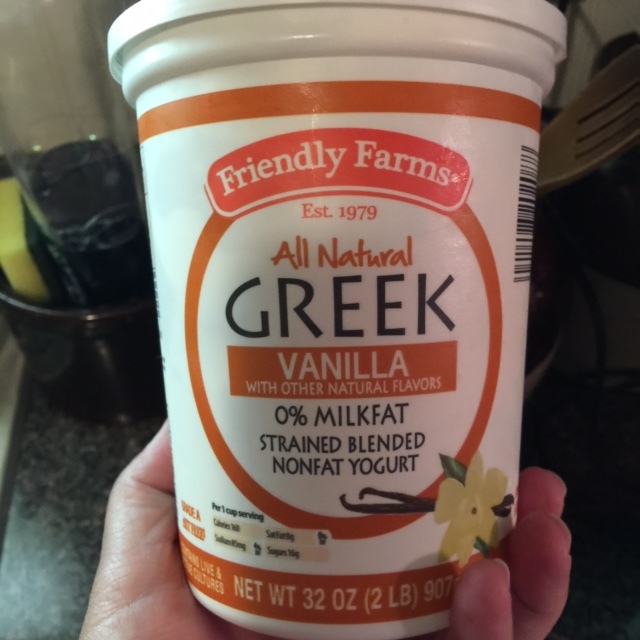 I prefer vanilla yogurt for this dip! Mix all ingredients in one bowl. Believe it, or not, that’s all there is to it! 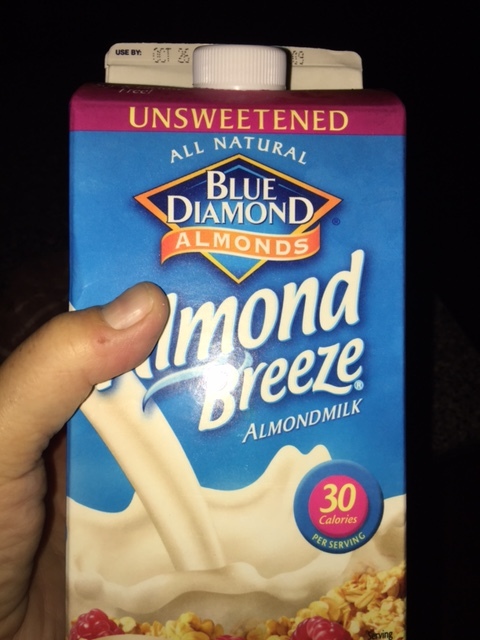 A simple, delicious, and clean treat! Now, for the best part! Eating this sweet and delicious treat. You can experiment and try a variety of fruits, but my favorite is apples. You can also increase the ingredients to make a larger amount of dip to serve at a party, family reunion, or any social gathering. This is a dip that is sure to be a hit, and among your guests favorites! A delicious dip for any kind of fruit! I would love to hear from you! 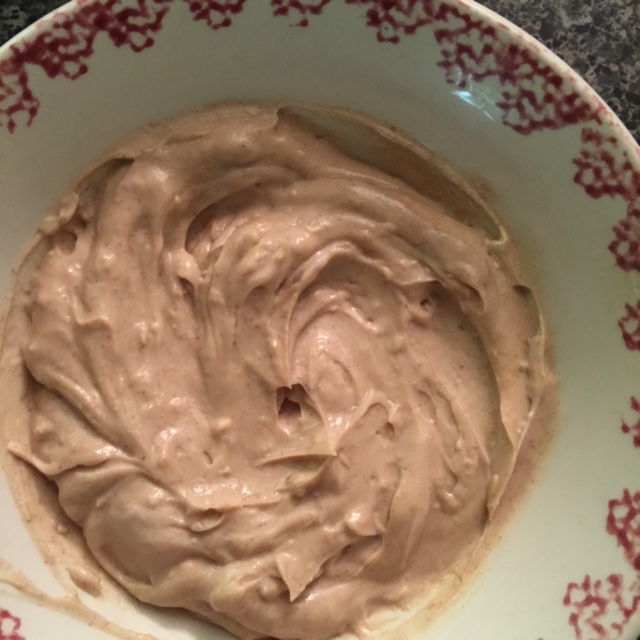 Feel free to leave a comment telling me about your experience with this easy and delicious fruit dip. If you enjoyed this quick and easy clean recipe, be sure to check out my post, Quick Easy, & Clean Coffee Mug Blueberry Muffins. Also, watch for my upcoming post, How to Make an Apple Pie Smoothie! Clean eating has changed my life in many different ways. I feel better physically, I have more energy and stamina than I’ve had in twenty years, and I’ve lost sixty-eight pounds during this three-year journey. Clean eating has changed the way I see food, and how I see my life. I am enjoying my life, my career, my Christianity, and my family more than I have in a number of years, simply because I feel better! I have learned that clean eating is not a diet, but a lifestyle. So, what does drying herbs have to do with clean eating? Everything! Herbs can enhance the flavor of an ordinary meal…turning it into an extraordinary meal! Herbs grown at home are also organic, and free of pesticides. Growing herbs can also be therapeutic and a source of relaxation. I have always dabbled a little with small pots of herbs in my kitchen. I enjoyed the convenience of having fresh parsley and chives at my fingertips. But, I wanted more. I wanted a wider variety of fresh unprocessed herbs that were organically grown and free of pesticides. 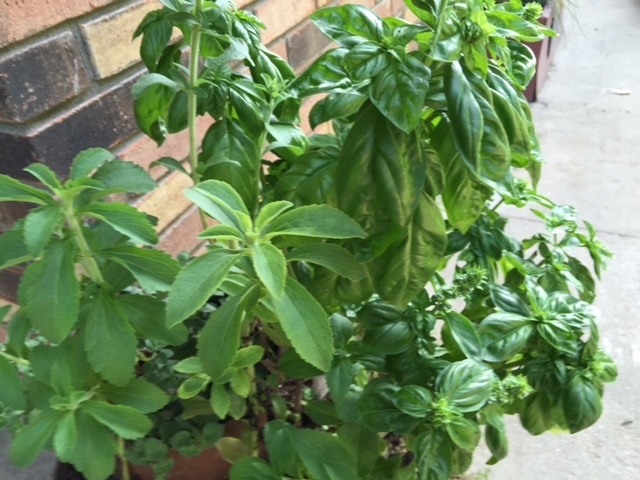 During the winter I planned a herb garden that included fresh basil, dill, a variety of mint, sweet herb, chives, thyme, oregano, and more. 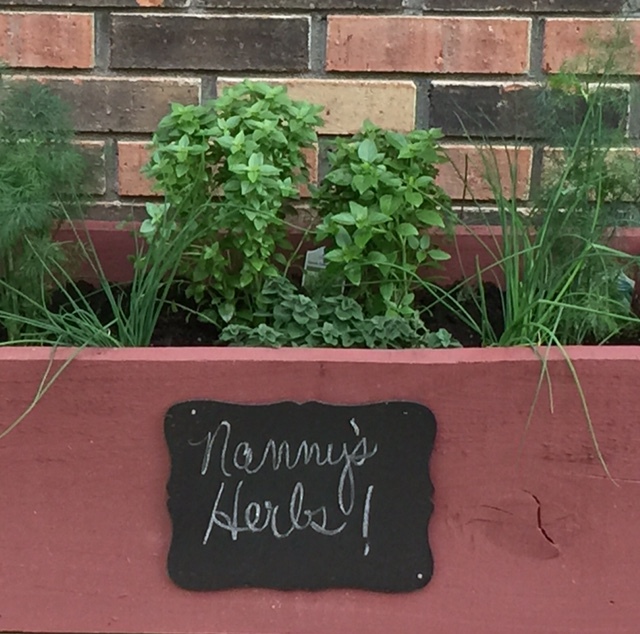 A few months later, my herb garden was a reality, and a success! Believe it or not, I raised enough dill to can and process several dozen quart jars of kosher dill pickles, fill my pantry with dried herbs for the winter, and also give an abundance of herbs to family and friends. We’ve enjoyed fresh, oregano, and chives all summer and still reaping the rewards from my small herb garden. I will probably harvest herbs at least two more times before fall at which time I will transplant most of the herbs inside. Transplanting the herbs will allow my family to enjoy fresh-cut herbs all winter, and start a fresh garden outdoors in early spring. There are several easy methods for dying basil. I often cut basil, tie it in small bundles, and hang it to dry, I also clip the leaves and dry in flat containers, and occasionally I like to use the dehydrator. My favorite method is hanging basil in bundles in my kitchen. The aroma of the fresh-cut basil fills the kitchen for days. I also prefer the intensified flavor of air-dried basil. 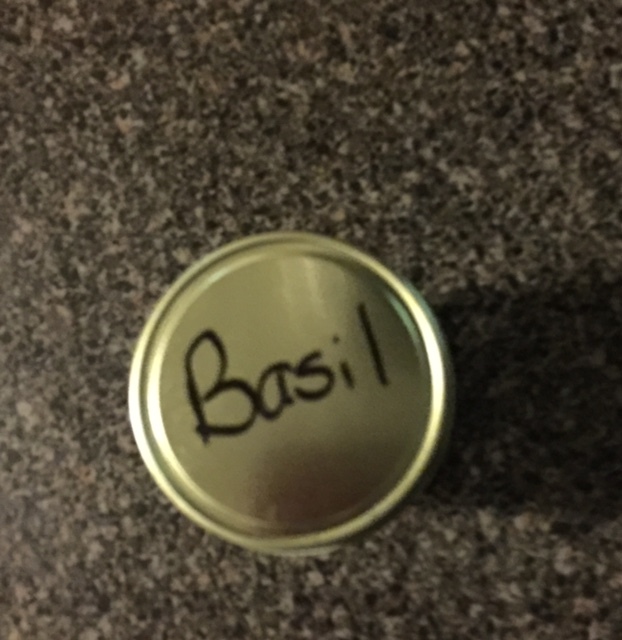 Today, I’m going to share step by step instructions of how to air-dry basil in flat containers. 1.) Cut fresh leaves from basil just before it flowers as the flavor will be at its peak. Discard leaves that have blemishes or bruises. 3.) 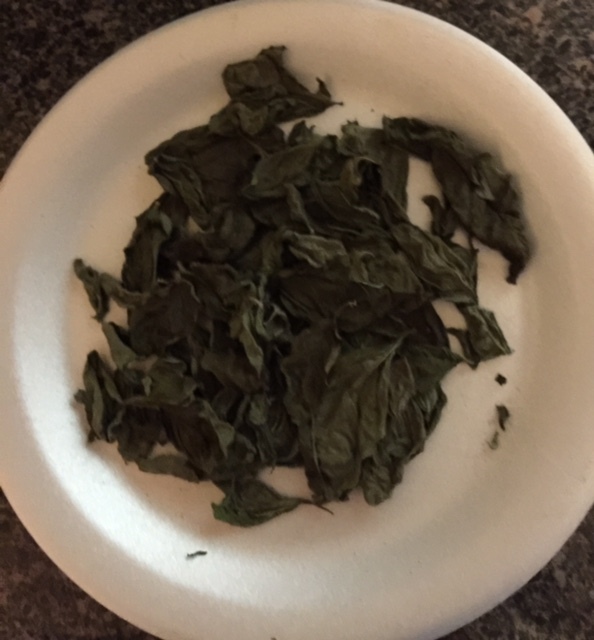 Lay basil leaves on a flat container such as a lined cookie sheet, or paper plate. I prefer using paper plates. 4.) Place in indirect sunlight. Herbs retain a better flavor if slowly air-dried, rather than drying quickly by sunlight. 5.) Check the herbs weekly until they are dry and crispy. 6.) 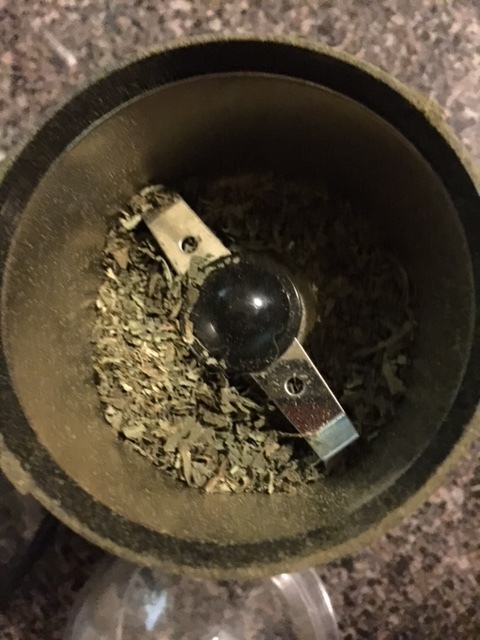 Place dried basil leaves in a coffee grinder and pulse until the desired consistency is achieved. 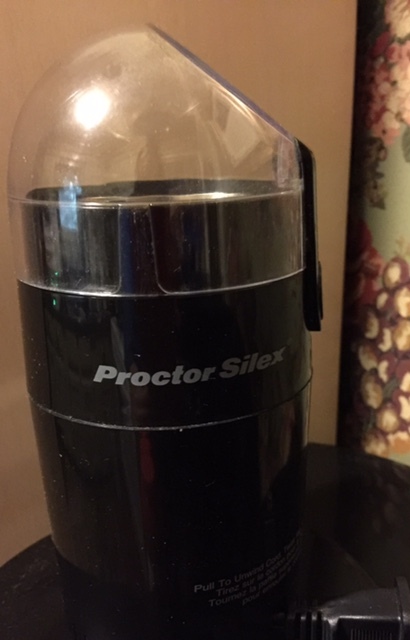 A great little inexpensive coffee grinder! 7.) Check basil after a couple of pulses to prevent over grinding. Repeat this step until all of the basil is ground. 8.) Place ground basil in a clean glass jar. 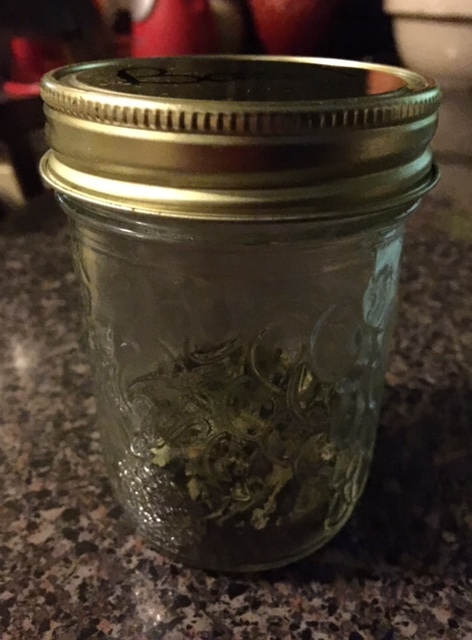 I prefer using glass jars as it helps maintain the herbs freshness. 9.) Don’t forget to label your herbs to prevent any possible mix ups. I’m anxious for you to grow and dry your own herbs! But, be warned…once you’ve tried both fresh and dried herbs, you’ll be hooked! There’s a distinct difference in the taste, quality, and cooking results. There’s no turning back to store-bought herbs! 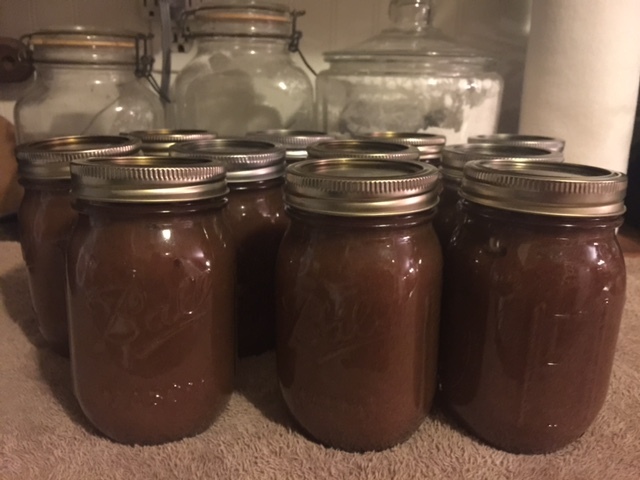 Life for this college professor has been quite busy this week with blogging, scoring graduate work, attending meetings, book club, canning apples, apple butter, and making a few other delicious treats. I’m not complaining…I wouldn’t have it any other way! 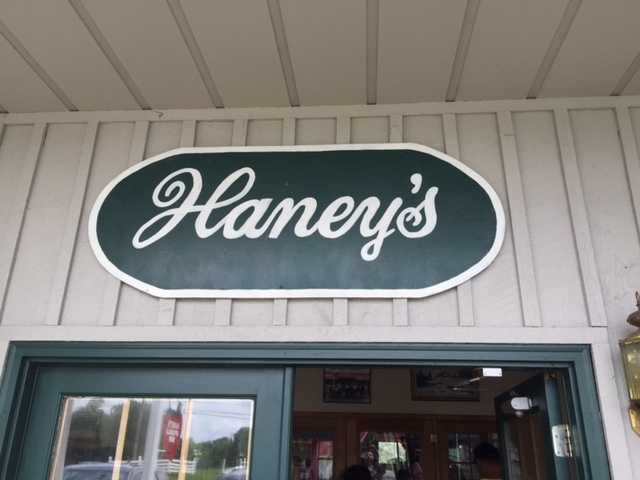 Our recent trip to Haney’s Apple Orchard resulted in more than just apple butter. 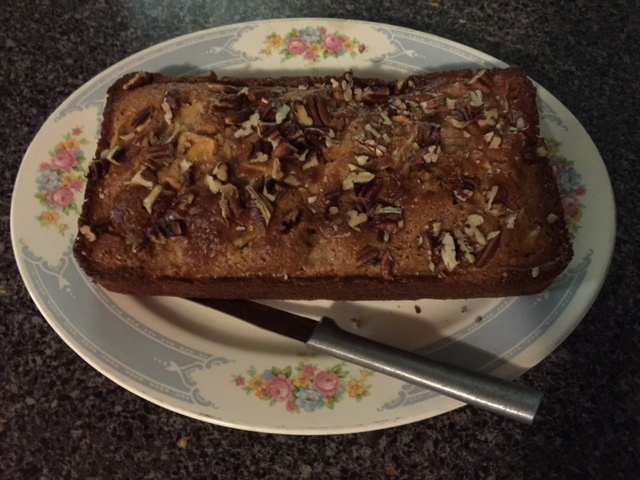 In my last blog post, I promised that I would share more of the delicious treats that we made from the beautiful sweet apples that our family picked. 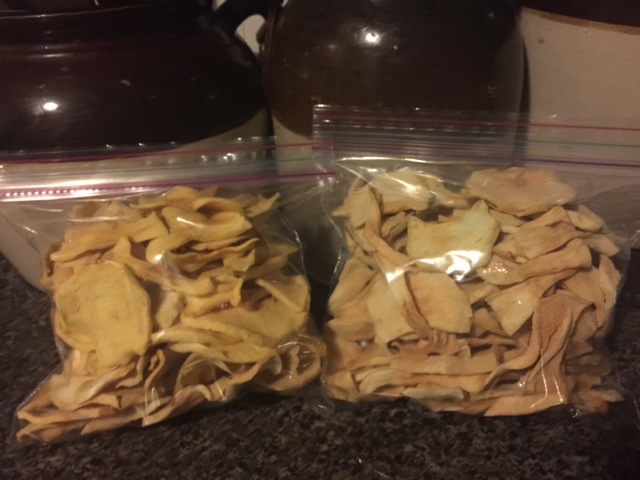 I’m excited to share with you how I turned one full bag of sweet and juicy fresh picked apples into delicious healthy dried apples. 1.) When I buy fruit, I prefer to buy organic fruit. I wash all fruit before I begin to ensure that it’s clean and free from garden pests and dust. 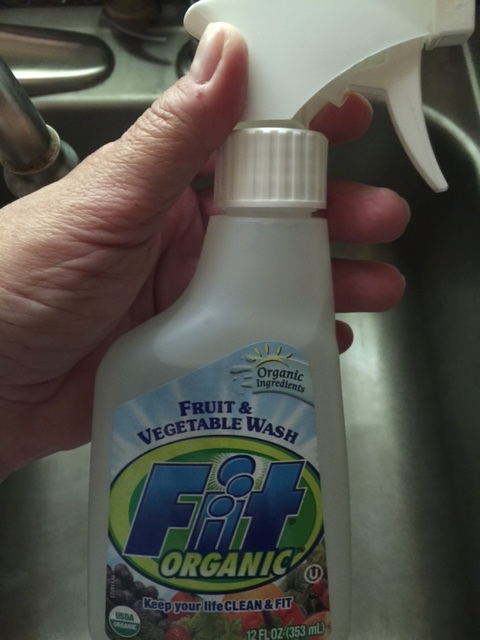 I like to use Fit organic clean spray. 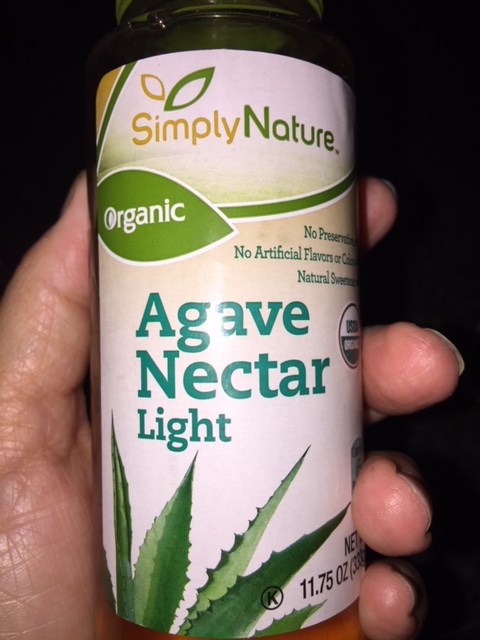 It’s simple to use, inexpensive, and can purchased at Wal-Mart. 2.) Next, you will need to peel and slice the apples and soak them in a lemon water bath mixture for eight to ten minutes. This helps prevent discoloring during the dehydration process. Remove the apples from the lemon bath and gently pat them dry with a clean paper towel. There are several methods to dry fruit. 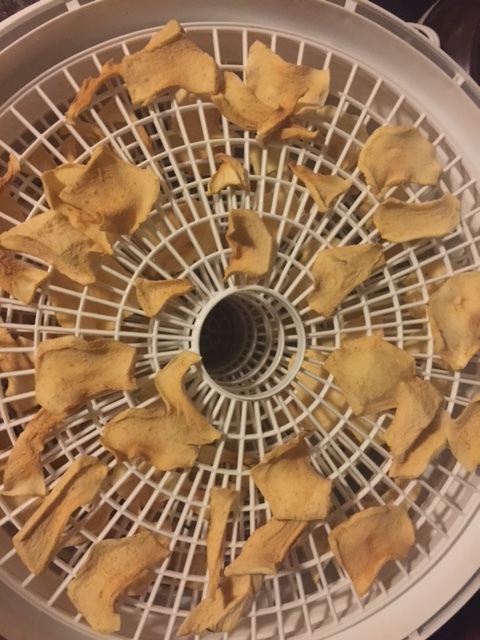 I personally like to use an electric dehydrator. It’s quick, the cleanup is easy, and I can dry more apples at one time. 3.) Place the apple slices in the trays of the dehydrator. It’s okay to place them close. They can even touch. The apples will shrink as the they dry. If you are using a dehydrator follow the instructions that came with it for time and temperature. 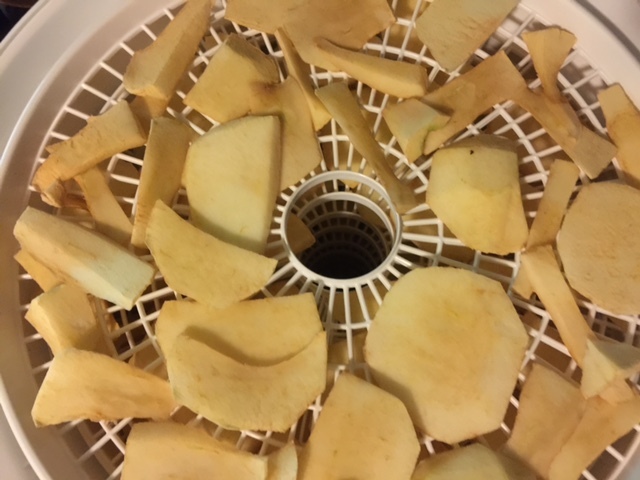 For example, my dehydrator instructions recommend apples to be dried at 135 degrees for 8 and a half to 9 hours. 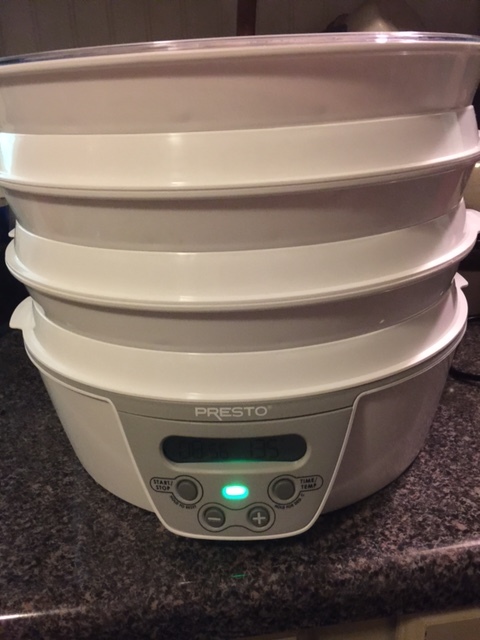 I love this dehydrator! I purchased it at a very reasonable price on Amazon. If you would like to purchase one, click on my Amazon link titled, A Few of My Favorites. Okay, back to dried apples. If you like your apples a little more crispy, you may leave them an additional thirty minutes. Also, for an even tastier treat, you may sprinkle the apple slices with cinnamon. This is one of my favorite sweet treats, and your house will smell wonderful while the apples are drying! 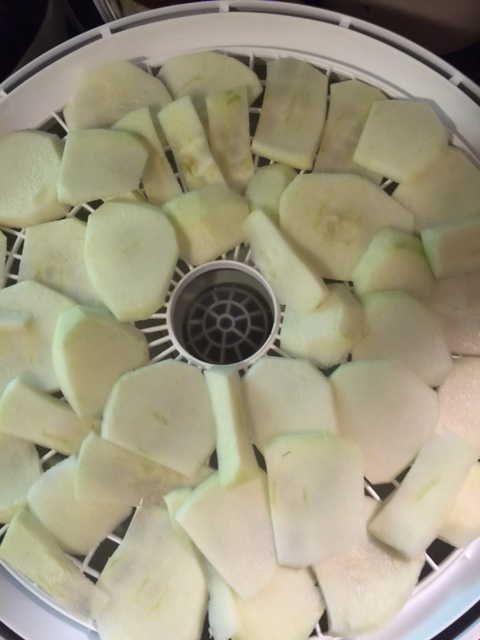 Allow the apples to cool in the dehydrator. Remove when they are cool and store in zip lock bags. There is no need to refrigerate dried fruit. If you are planning to cook with the apples, you can vacuum seal them for a longer shelf life. You can also dry apples in an oven. It’s fairly simple and works well. 1.) Wash, peel and slice apples. Soak them in a lemon juice bath. 2.) Line cookie sheets with parchment paper to prevent sticking. Set your oven temperature to 150-200 and bake the apples for one hour. Take the apples out of the oven and carefully turn the apples over. Bake them for an additional hour. If you like your apples a little crisper, you can bake them an additional thirty minutes. Check your apples frequently, as all ovens bake differently. Once you turn the oven off, leave the apples in the oven for an additional one to two hours. You may crack the door to your oven slightly while the apples are cooling. Allow the apples to cool completely in the oven and remove. Both methods work really well and produce a wonderful sweet treat to snack on, or use in recipes such as apple stack cakes. That’s a recipe for another blog! I know your family will enjoy your fresh dried apples as much as mine does! 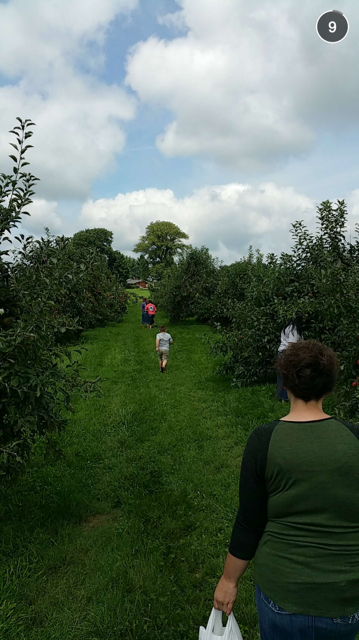 A couple of days ago, we decided to visit Haney’s Apple Farm located in Nancy Kentucky. I want to take a few minutes to give a shout out to this exceptional family owned and run business. The grounds were beautiful, clean, had a nice large variety of ready to pick apples, already picked apples, and many more apple related products, and treats. The prices were affordable and they had a friendly and informative staff on hand to answer all of our questions. After we picked three bushels of apples, we enjoyed eating a delicious homemade fried apple pie in a quainte little café located at the entrance of the farm. 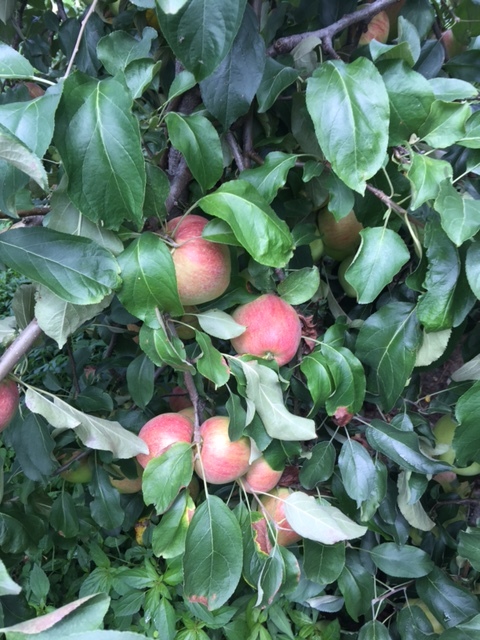 All in all, it was a memorable day of picking apples in preparation of making and canning apple butter, as well as a few other family favorites. 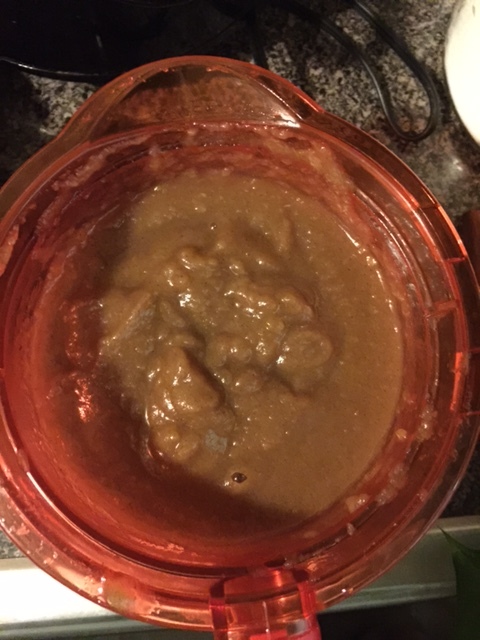 I’ll share those favorite recipes in future posts, but for now…let’s make apple butter! You will need the following ingredients & tools to make and can your apple butter. Keep in mind that you can season to suit your own taste. After adding these ingredients taste and add additional spice if necessary. 1.) Wash and rinse jars, bands, and flats in warm soapy water. Next you will need to sterilize jars, flats, and bands. This can either be done by using the dishwasher with hot water, placed in the oven for ten minutes on medium-high heat, or boiling for ten minutes. 2.) While your jars are sterilizing, peel and slice one half bushel of apples. 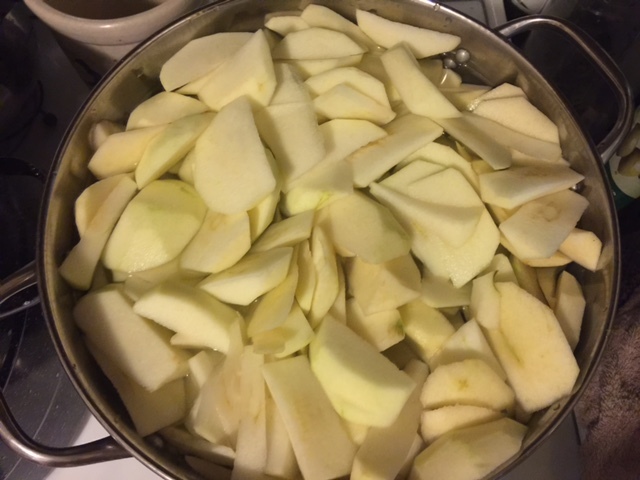 Place apple slices in the stock pot and add water. Cook over medium-high heat until apples are tender, not soggy. The apples will swell up and rise when ready, so allow room for expansion. 3.) Turn off apples and transfer softened apples to a food processor. This might take several attempts to work through all of the apples. 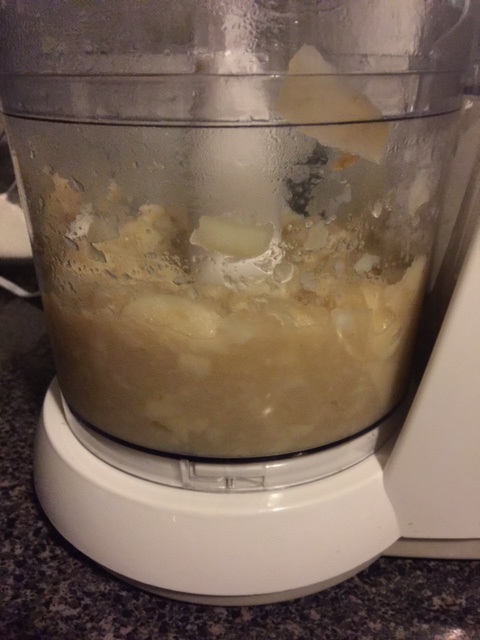 Process the still warm apples in the food processor by pulsing a few times. 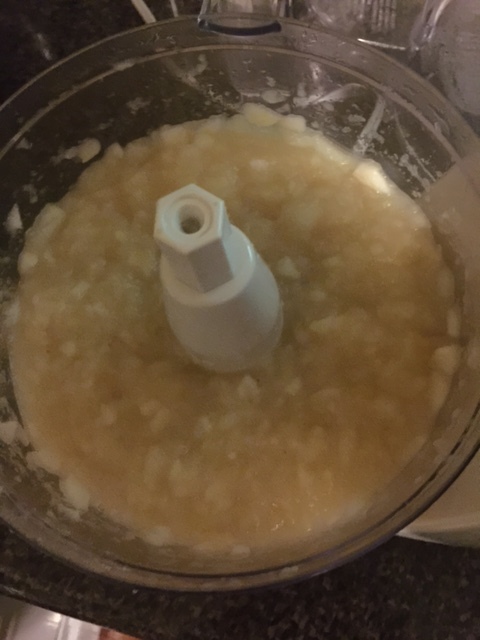 The apples will look similar to apple sauce. If you don’t have a food processor you can use a blender or any other kitchen gadget that chops, such as a ninja or bullet. 4.) 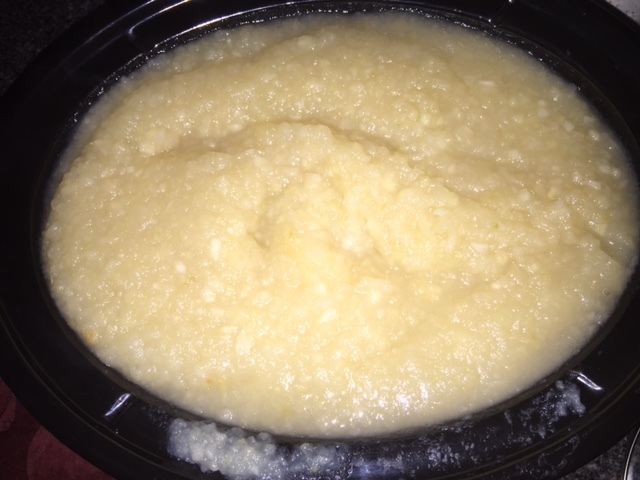 Transfer each container of warm diced apples to a clean crock pot. Turn the crock pot on high. 5.) Now you are ready to add your spices. Remember, you can add additional spices to suit your own taste. Some people prefer more cinnamon, while others like more all spice. That’s totally up to you. Once your spices have been added, stir well and cover with a lid. You will need to stir frequently while cooking for four hours. 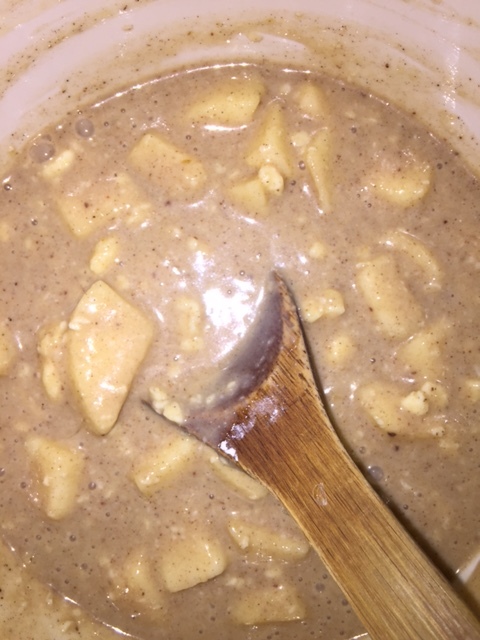 Your apple butter will get darker each time you stir it. Again, add extra seasoning after taste-testing your apple butter if necessary. I always start with the amount I have listed above and sprinkle or add as the apple mixture cooks until I reach the taste that I prefer. The apple butter will become darker as you add spices and cook it. 6.) 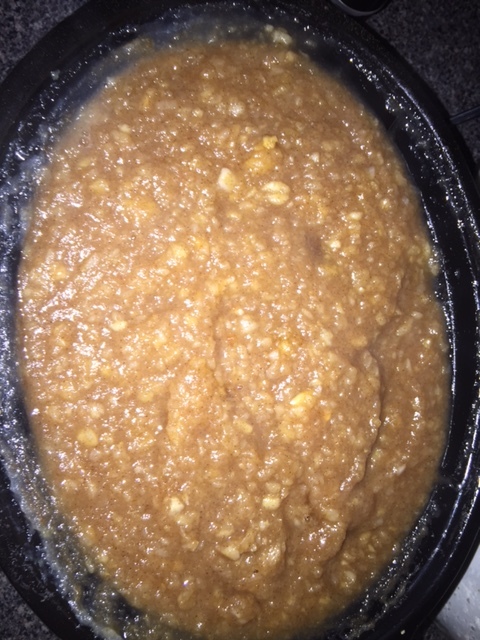 After the apples have been seasoned to taste and cooked for four hours, turn the crock pot off. Next, you will transfer your apples back to the food processor. 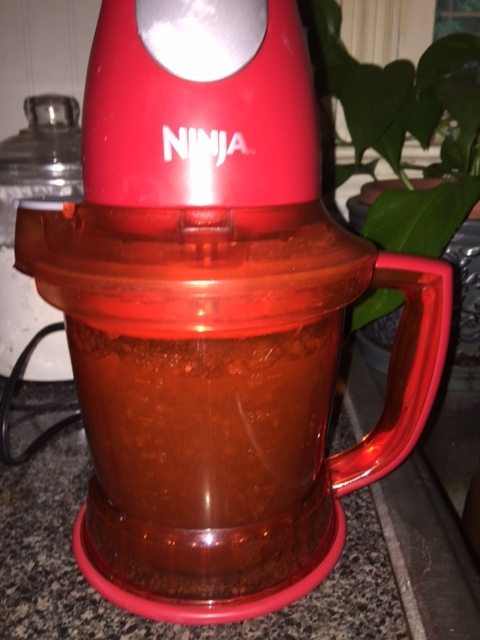 I prefer using my Ninja for this stage, simply because the apple butter pours out into the jars easier. Either device will produce the same results. You will pulse the warm seasoned apples a couple of times to achieve the desired smoothness. It will not take very long as the apples are soft and easily processed. 8.) Process the jars in boiling water for twenty minutes. Remember the water must be over top of the jars. After processing carefully remove jars with a jar lifter and place them on a bath towel to cool. You will immediately begin to hear the beautiful popping sound that we love to hear! 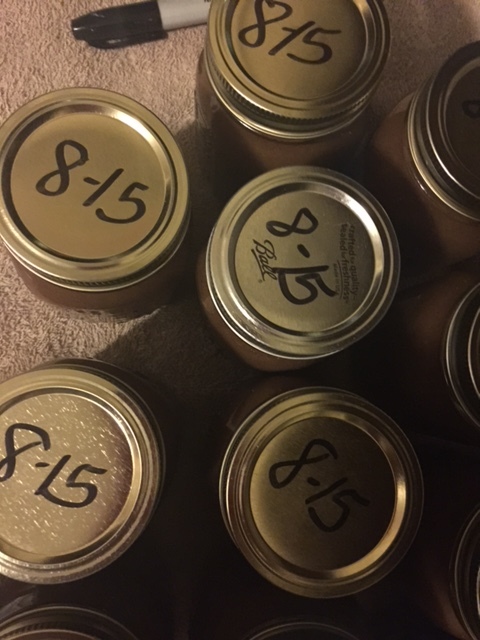 Once the jars have cooled add dates to the flats and check bands to ensure tightness. I look forward to hearing from each of you! I love feedback! My husband and I both grew up in the mountains of Kentucky where summers were long, hot, and filled with outdoor adventures. Playing in the creek, swimming in the river, and exploring the mountains was part of our weekly routines. But, mountain living was not all fun and games. We had daily chores to do as well, many of our chores were garden related. Neither of us are strangers to garden-work, or the work that comes with harvesting. Speaking of harvest time…it’s harvest time on our small farm! We’ve been picking green beans for weeks to eat for supper, and we’ve put a few quart bags in the freezer. But, it’s that time of year when the vines are hanging full of beautiful green beans, which means it’s picking time! 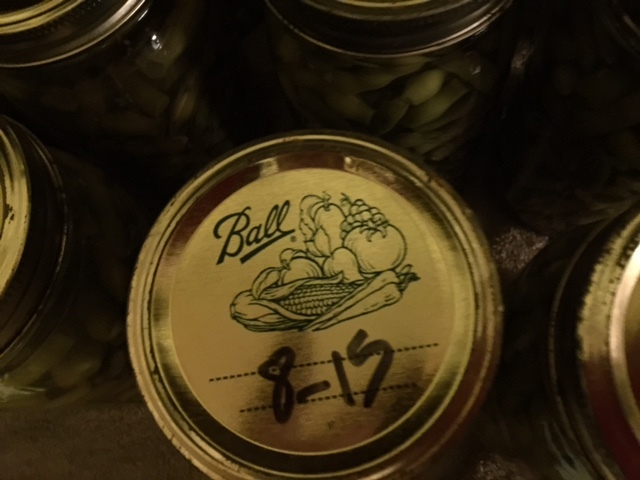 Last week, while my husband and I were picking beans and canning, we began reminiscing about the jobs we were given as children during canning time. It was unanimous, both of us were always designated, the washing jobs. Yes, we were washers. We determined that it was our small hands that landed us this job. We didn’t mind, because we both loved canning, even as children. We still enjoy the pleasures and work that comes with the bounty of a garden. 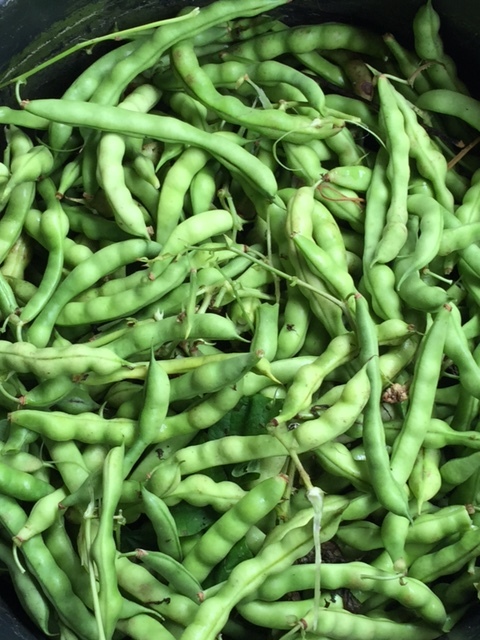 It’s not too late to fill your pantry shelves with your very own canned green beans. 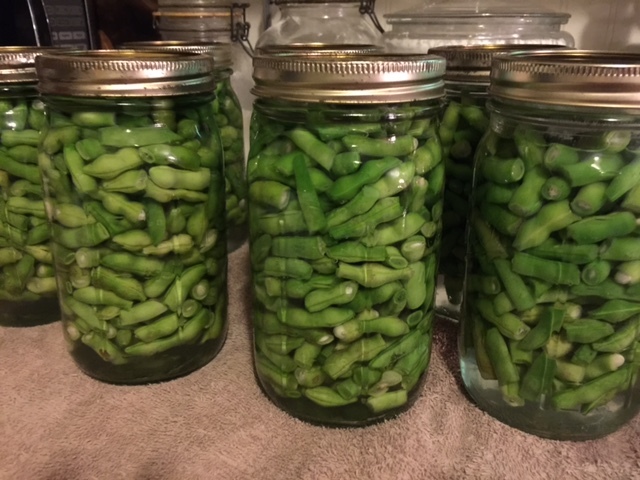 I’m excited to share my family’s recipe for canning green beans with you. This is an easy and time-tested recipe that our family has used for generations. 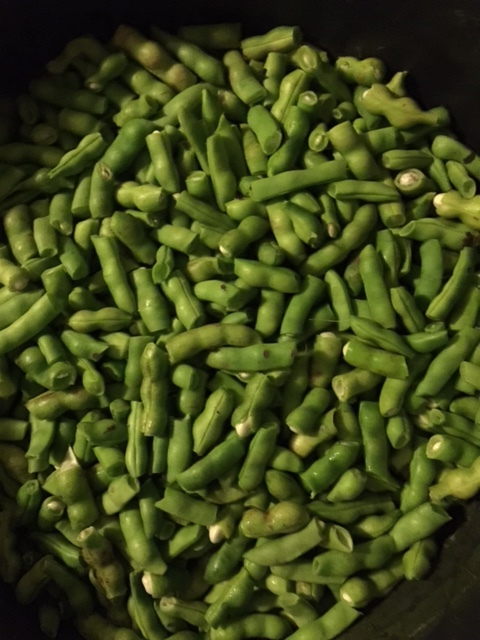 I know your family will enjoy these tasty green beans this winter when the snow is flying as much as we do! 1) Find somewhere comfortable to string and break your beans. We prefer sitting outside on the porch and stringing in the early morning hours. However, when it’s too hot, we’ve been found stringing them in the kitchen where it’s nice and cool! 2) Next, wash the beans in cool tap water to remove any traces of garden dirt, or insects. 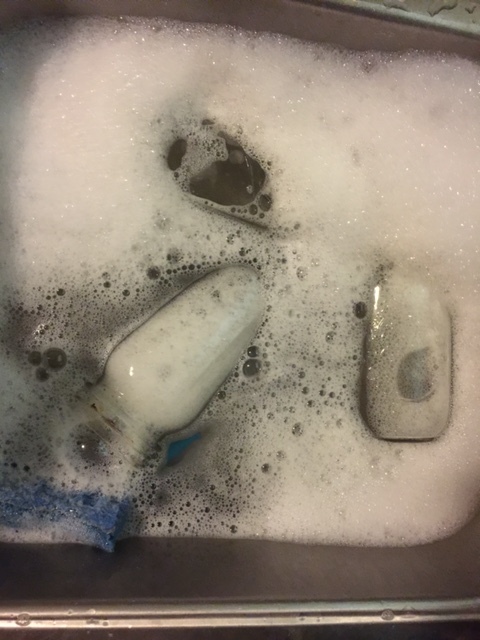 3) Wash jars, rings, and flats carefully in hot soapy water. 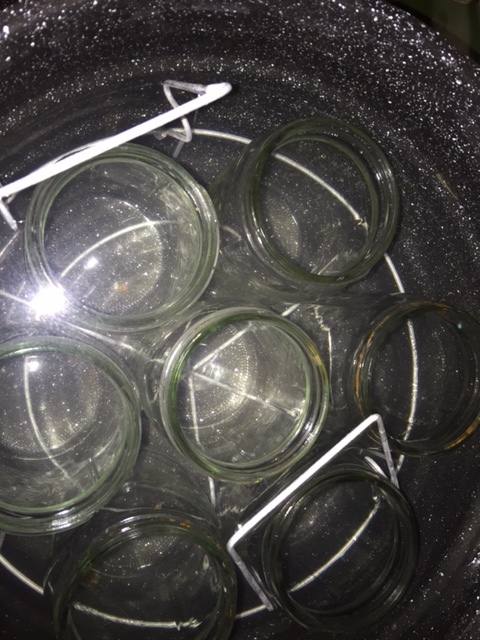 4) Sterilize jars, rings, and flats by placing them in boiling water for ten minutes. I use the canner to boil my jars in. Sterilizing jars is a must. It helps prevent bacteria from forming. 5) Fill warm jars with clean beans and add boiling water. Allow an inch for head-space. Add a teaspoon of salt to each jar of beans. Place flat on the top of the jar and tighten the ring. The ring doesn’t have to be extremely tight, as you will tighten them again after the canning process. 6) Carefully place filled jars in canner of hot water. The water should cover the jars with at least one inch of water. 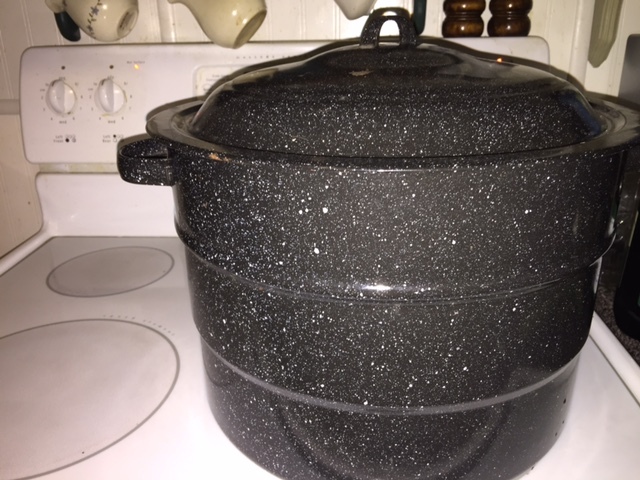 Place the lid on the canner and turn the heat up to medium high. it at the Dollar General Store for 10.00! 7) After the water comes to a boil, set the timer for one hour. Process beans for the entire hour. 8) Turn the burner off and carefully remove jars out of the boiling water with a jar lifter. If you don’t have a jar lifter, you can dip some of the water out and remove the jars with an oven mitt, or a rubber glove. I place my jars on the counter top on a bath towel to cool. You should immediately hear that wonderful popping sound that ensures your jars are sealing! Once they’ve cooled check rings, and tighten as needed. 9) After the jars have cooled, write the month and year as well as the variety of beans on the lid with a permanent marker. 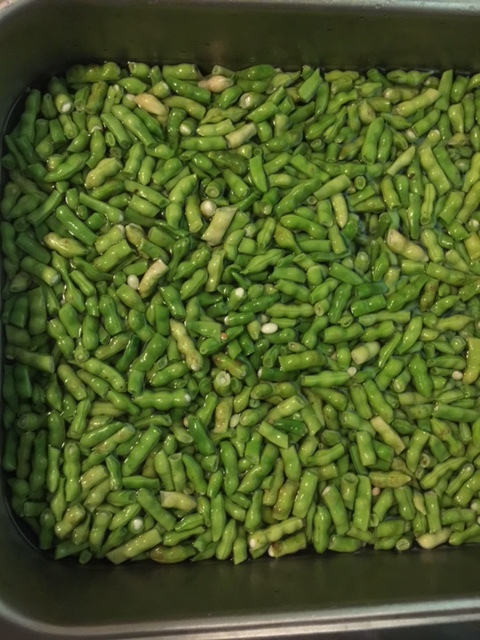 Now your ready to fill your pantry with your very own beautiful green beans! My family has loved these tasty beans for generations. 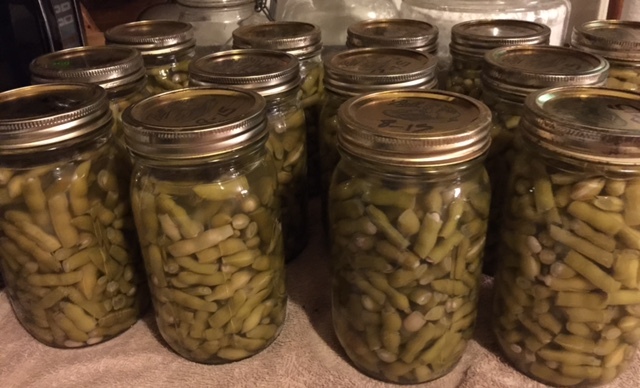 I must admit, I enjoy the feeling of accomplishment and small sense of pride that I feel when I open a fresh jar of my very own green beans. They’re a wonderful treat in the winter when the ground is covered with snow! They’re also a great addition to homemade vegetable soup, but that’s a recipe for another blog! Truthfully, they make a fine addition to any meal, any time of the year! I hope you and your family enjoy my time-tested green beans year after year! Feel free to share my blog with family and friends. I would love to hear from you! 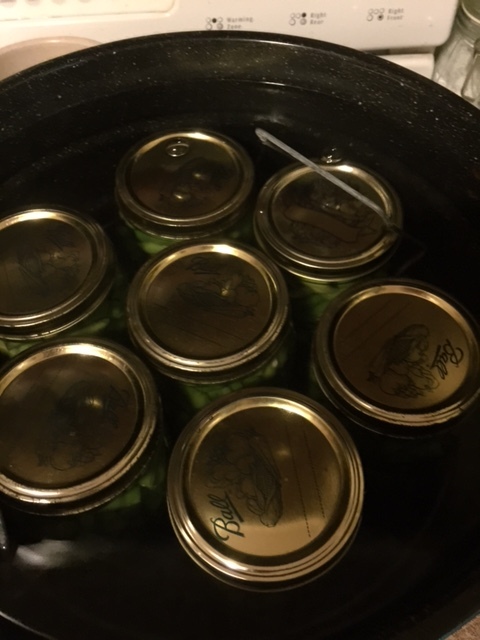 Feel free to leave a comment and share you families canning experience! Our entire family enjoys indulging in spicy salsa. It tastes great on organic blue corn chips. It makes a Mexican omelet spicy and tasty. We also enjoy adding it to pinto beans, or as we call them, soup beans. It’s a wonderful addition to taco salads, and many more dishes. We have found numerous uses for this wonderful spicy treat. We also found that the time spent together making and canning the salsa is just as fun as eating it! I wanted to share my recipe with you and your family. Are you ready? It’s easy, clean, and tastes great! Carefully place clean tomatoes in boiling water for three minutes. Remove tomatoes and submerge in ice water to cool. Once the tomatoes cool they are easy to peel and core. Combine all ingredients in a large pot and bring to a boil, stirring frequently, then reduce heat and simmer for 10 minutes. Ladle hot mixture into clean sterilized pint or quart jars, leaving one-half inch head space. Adjust lids and place in canner and boil for 15 minutes. (I prefer to use a stove top canner) This yields 13 pints or 8 quarts. I hope your family enjoys this recipe as much ours does. Feel free to leave comments about your salsa experience. You might find a use that we’ve not tried! We’re open to suggestions. Remember, you can modify the spices to suit your own taste.